Editor’s note: This restaurant is on the site of the former La Hacienda. Since the name has changed, we are treating it as a separate restaurant. Our review of La Hacienda will remain online. I recently headed over to the levee to review a restaurant, as one does. Unfortunately, that restaurant wasn’t yet open and I had some time constraints. I decided instead to go to La Hacienda El Sol, which was formerly La Hacienda, which was El Rodeo for time immemorial before that. It was busy, but not packed, and I was seated right away. The decor is the colorful scenery that has become de rigeur in Mexican restaurants these days. The walls had plenty of TVs, including a projector with the screen right above my head. I don’t remember what was on the TVs, probably TV stuff, but I don’t recall paying much attention to them. One of the intriguing things about La Hacienda El Sol’s menu is the rotating offer of all-you-can-eat dishes during the week. On Friday, the all-you-can-eat offering is nachos. Friends, let me tell you that I took no time in deciding what I was going to order. 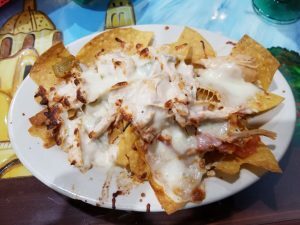 Unfortunately, the nachos turned out to be a little disappointing. They were covered in melted cheese, which was good, but a queso would be easier to eat and more mixable. I chose chicken as the meat, expecting shredded chicken. What I got instead was giant chunks. There was no lettuce, and I found one half-heartedly cut slice of tomato at the bottom. It may have gotten there by accident. It wasn’t bad, but it wasn’t all that good, either. I was never asked if I wanted a second round, which was fine because I didn’t particularly. I will say this for the food: it arrived very quickly. And the “Blue Hacienda” margarita that I ordered went down well. The server was attentive without hovering. I’d go back to La Hacienda El Sol if someone asked me to, but I probably won’t pick it.